With the 1/10 worlds ready to start at the beginning of October all the key players will have their latest and greatest chassis as they battle for victory. Sieve the rage in the race around the world since its launch, BD7 2014 Yokomo of Sale is, swept the renowned big race! The BD7 2014 the RC racer in the world is of interest, as competition touring car the ultimate, high wall, we bathed in the hot line of sight as a benchmark from engineers Competition manufacturers around the world now! But still Yokomo not stop by! 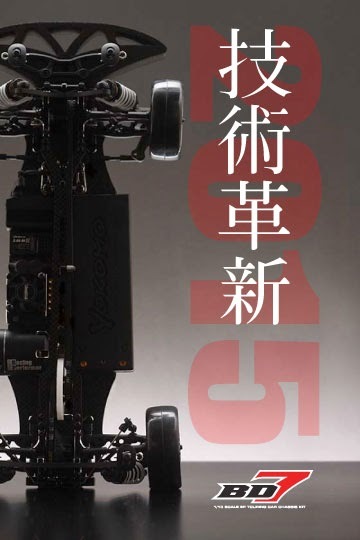 Yokomo advances the research and development always thinking that there is no limit to technology, you can be forthcoming with confidence the BD7 2015 NEW played culmination of the current, the innovation further. Of course, the 1/10 EP Touring Car World Championship race which starts from October 9, Yokomo team is charged with commercial version of BD7 2015 new released just before, we will challenge towards the victory! Please stay tuned! ! Support of everyone who, thank you in the future! !